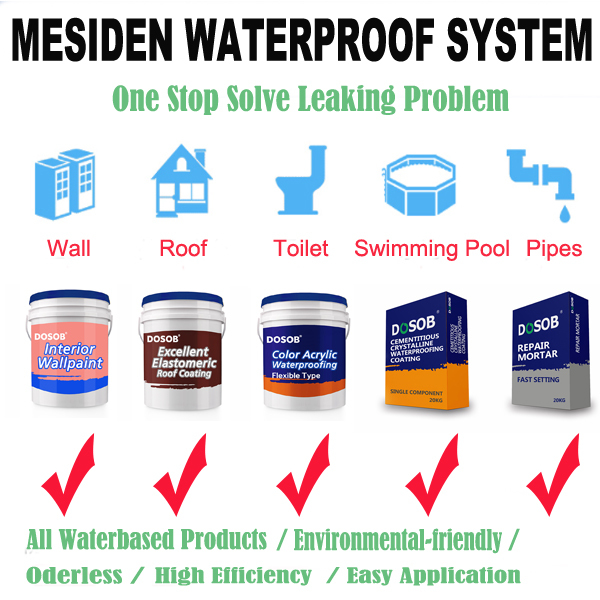 Mesiden Building Material Co.,ltd is a professional building material manufacturer located in Guangzhou, China. We are majorly manufacturig Waterproofing Products and Adhesive and Sealant products to our customers so as to solve a whole set of waterproofing problem. For concrete roof, we will suggest to use Waterbased Polyurathane Waterproof Roof Coating so as to solve water leaking problem. For metal roof, we will suggest to use Waterbased Elastic Waterproof Acrylic Roof Coating so as to solve water leaking problem. For flat wall and floor, we will suggest to use K11 General Waterproof Coating. For general use purpose, we will suggest to use JS Waterproof Coating.